Anyway, I finally had a glimpse of the sun just long enough to photograph these like I wanted to... Unfortunately that was two months ago! Oops. Whatever. I shouldn't feel bad about posting a collection late... But I do. Absolute. Pretty light turquoise blue holo. This makes me think of mermaids and sparkling water. The holographic effect is subtle but adds a little bit of 'magic' to the nails. Brilliant. Mauve pink holo. It's pink. Essence. Warm pink-peach holo. This was my least favorite of the collection. The base is oddly dense and frosty, almost like a metallic peach frost with little holographic particles. And, as you are all unfortunately aware, dense frost base plus glitter equals chunky, lumpy-looking finish. The color isn't my favorite either. Too warm for my skintone. Gem. Mousy grey/taupe base with warm red/brown flash and chunky holo. This one is my favorite of the collection, with Jewel coming in close second. It's holo and duochrome, suh-weeeeeeet! The hologram effect in this is different from a lot of other holos I have. It's really densely packed medium particle glitter, not smooth holo platelets like other holo polishes. It seems like it would look chunky, but it really doesn't. Maybe a little, but there's so much holo that it just looks like crazy rainbows. Jewel. Greyed brown base with warm red-gold flash and chunky holo. Just like Gem but brown, same chunky holo particles, same subtle duochrome flash. Love it love it love it. Prize. 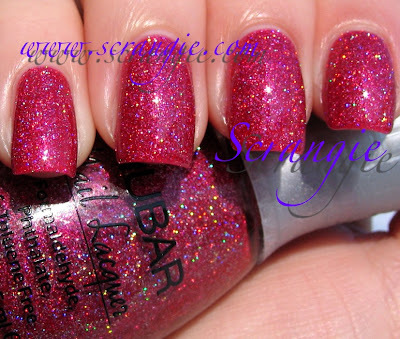 Reddish pink with chunky holo. I was really hoping this would be red, like a really rich deep true red, but it's not quite there. I still love it, it's crazy holo! It has the large particle holo grains like Gem and Jewel. Spark. Warm light tan-brown holo. Sounds like an oxymoron, but I'd call this an "office appropriate holo". It's light and kinda almost blends into my skin. Very strange but still cool! Treasure. Light lavender purple holo. This is so delicate and feminine, it's not 'me' at all but I can't stop looking at it. It reminds me of this girl I went to high school with... Yeah, that's a useful description! But really, this is an 'airy', sparkly kind of fairy-tale purple. Super cute. These have a unique type of holo. I had anticipated them to all be that smooth, thin metal-foil-like finish like Nubar Reclaim, but none of them are. Half of these are somewhat similar to the OPI Designer Series 'light' polishes, like Sapphire or Chiffon or Shimmer. 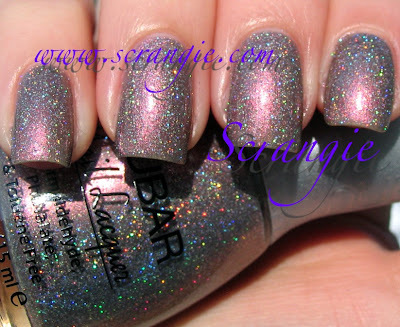 The base is a thick, translucent jelly-like finish with somewhat sparse holo particles suspended in it. The end effect is more scattered than linear. The other type of holo in this collection is the big-chunky-particle type. I don't own too many holos like this, so I'm not sure what it most resembles. I've heard that some Japanese polishes have a similar type of holo. The closest thing I can think of that has similar holographic effect is Massini Slamming Red/Purple Medallion, but those are all glitter. 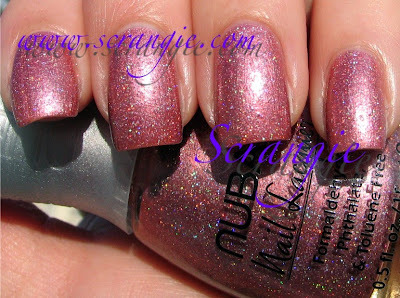 These Nubar ones are not entirely glitter, they just have a ton of holographic grains all packed together. It has a slight chunky look to it, but when it catches the sunlight the holo effect is insane. Very mesmerizing. The formula was a bit of a surprise for me. I'm very used to holographic-finish polishes being thin, dense/opaque and foil-like. These are quite sheer. All pictures here are of three coats. I think they needed all three coats as well. Two coats had just too much visible nail line for me. There isn't a consistent texture throughout the collection. Some are thick, some are thin, some dry quickly, some take a bit longer. The formula isn't bad, it didn't really give me any problems, it's just inconsistent, that's all. My only criticisms of the collection are personal preferences. I would have liked to see more unique shades (more mauve pink holo??) and I would have also liked to see a stronger holo effect. I don't know, I just have pictures of Nubar Reclaim dancing in my head... I think it's set a new standard in my mind for Nubar! ps-no one minds if you post late! Very pretty, although I agree that we need some new holo colours (deep blues, greens, purples, a great black....). All of these are great, but Gem is totally awesome. I love this collection and owns Gem and Jewell. Nice swatches. I couldn't catch all beauty in pictures. I love anything and everything Nubar makes, but I've been resisting these...until now. I love you Scrangie, my bank account does not. My favourites are Gem, Jewel, and Spark from your swatches. Gem is probably going to be a favourite because I don't think I've seen a similar coloured holo. I can't wait until they are available at the Canadian distributor. I've missed your nails. I don't own a single Nubar. I'm holding out for when I have funds for fortress, though holos are looking more and more enticing. I agree with Ainos2, I am in love with Gem.It is outstanding,and will be my first purchase from Nubar. Don't feel bad about posting these late, I am glad you waited! I didn't want any from this collection until you swatched it, you have the best pictures of it! I like Absolute, Gem, and Jewel. I almost peed my pants when I saw the picture of Gem. Duochrome and holo together? Whoa! I got Gem, and I love it sooo. It is such a cool color. How timely! I'm wearing Spark today and I completely agree with your description... work appropriate holo. It's like a secret is hidden on my nails! LOL! Good to see ya, Scrangie! These look amazing!!! Thanks Scrangie!! I agree with you on the two favorites. Lovely glitters. I don't think I need any of these. I have a million glitters from China Glaze's collection of last year. Thanks for posting this! I agree, different colors would be great. I would have liked to have seen a deep blue or green, personally. Beautiful swatches, thank you! I'm loving all of these! Gem made me think of Jem and the Holograms! Remember them? LOL. I really love this collection! And usually I'm all over the jewel tones, but in this one I especially like the neutrals. I bought Spark a couple of months ago. A lot lighter than I thought it would be(I thought it would be a dupe for Loreal Bijou B.Gutsy, but i like it. I shows up a bit silvery on my black skin tone. Very nice swatches! Thanks for showing - and it's good to read you again! I actually broke down and bought the set as soon as I could, but so far I've only worn Gem and Spark. I was undecided about Spark when I first had it on but I grew to really like it! ...Anyway, yeah, the collection could have used a green. I'm more a blingy holo fan but if I do want something more subtle or work appropriate at least I know where to go. Oh and that chap stick I mentioned was the mentha lip balm in the black tube! Don't know if you are interested but it really is great! I loooove how many grey/brown/taupey holos there are in that collection - I would never think to pair holos with a taupey colour! Gem was the stand-out shade for me as well - I love it. I guess it's holo glitter in a jelly rather than the full on holo effect. Which is a shame but doesn't make it any less pretty. Totally with you on Spark being work appropriate - I think I said the same thing! Absolute is gorgeous. I love Gem, too. Prize is gorgeous. I totally agree with Elizabeth: "I love you Scrangie, my bank account does not" :D Lovely swatches, as always! Oh la la love! Gem and Jewel are now on my list! Scrangie, I love you, and you totally began my love of polish. I just want to say that - because it seems like we go through similar things (depression, deeply - to the point where you can't even enjoy the things you love) and oh. I do want to tell you what an awesome job you do. Just a nugget of encouragement is enough to get me through a day, and I hope it's the same for you. I am totally not the type to do this, but :D! PS! I know you might not publish that comment but as long as you read it, I hope it made you feel better. I really like these holos. I don't have any Nubar either, still. I really need to get some, they have some awesome colors. Jewel is incredibly beautiful! I wanttt. Gem and Prize are really luxe.